Pregnancy is a step into the unknown. It can be the most wonderful time in a person’s life, but it can also be intimidating. For women living with migraine disease, contemplating pregnancy can be downright frightening. I always assumed I would not have children. Motherhood and pregnancy seemed like an unthinkable undertaking to someone experiencing daily migraine since the age of four. But very suddenly, after 26 years of perfecting various migraine strategies and medications, I won my personal migraine battle. This was so life-changing for me that after a month without daily migraines I noticed flowers were beautiful for the first time. Four years later, I got up the courage to become pregnant. In truth, I was practically paralyzed with fear. I had heard a number of rumors about migraine and pregnancy. Many women reported their migraine disease improved, but I was skeptical. The medical literature reports that the vast majority of women (80-90%) experience some relief during pregnancy. For some, their migraine symptoms disappear completely. However, it has been reported that up to 35% of women experience migraine attacks during pregnancy, and 26% of those report that attacks in the first-trimester cause moderate to severe disability. During my first pregnancy with my daughter my migraine attacks got worse; bad enough that my doctors performed a C-section slightly early at 38 weeks. But, something possessed me to go back for more. In my second pregnancy, my migraine disease almost disappeared for the entire nine months, and I had my son. Last month, in an article on breastfeeding and migraine medications, I pointed out that our culture puts a lot of pressure on breastfeeding mothers to avoid medications. The stigma and cultural pressures are even more prevalent for expectant mothers. Studies have demonstrated that not just pregnant women, but also their healthcare providers tend to overestimate the risks associated with using medications during pregnancy. In one of the few studies conducted on this topic, it was shown that 70% of pregnant women with migraine use some sort of medication. Nine out of ten pregnant women with migraine deliberately avoid migraine medication despite needing it on one or several occasions. Women also report purposely not adhering to a medication regimen prescribed by their physician for migraine during pregnancy stating concerns about the possible effects on their baby. A recent medical article indicated that many pregnant women who arrived in the emergency room with status migrainosus (a migraine attack lasting longer than 72 hours) had not taken any migraine medication at home to avoid this severe problem. The authors of the paper suggest that this was very likely due to fear of taking medicines in pregnancy. 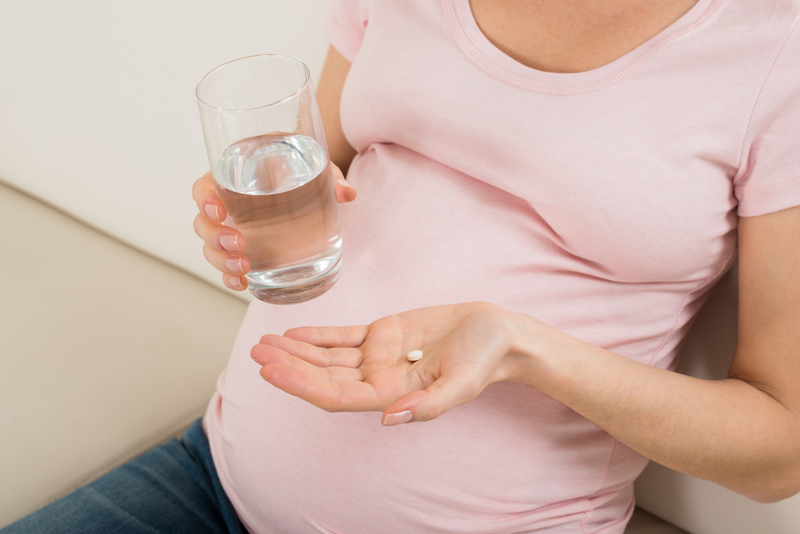 The simplest rule to follow in pregnancy is to limit medications as much as possible. However, many women force themselves to endure quite a bit of illness, pain, and suffering thinking they are doing what is best for their unborn child. Choosing to avoid treating migraine disease altogether is not a good idea, particularly for women with frequent or severe attacks. Uncontrolled migraine during pregnancy can easily lead to consequences that are bad for both mom and baby. Migraine exacerbates sleep problems, increases stress, and can lead to depression and negative mood. It also causes dehydration and poor nutrition, particularly if nausea and vomiting are involved. Active migraine during pregnancy has actually been associated with certain vascular problems. Never assume that allowing yourself to be sick and in pain is the best scenario for you or your unborn child. Most often, women are advised to discontinue use of their prophylactic migraine medications when they become pregnant. This keeps the baby from being exposed to medicine while mom determines if pregnancy itself will ameliorate her migraine pattern. This transition can be difficult and is likely different for everyone. What does medical science actually have to say about the dilemma of migraine medicines and pregnancy? If you find that you are unable to stop your preventive medicines, or that your migraines continue in pregnancy, there are options available to you. The diversity of migraine disease makes it impossible to cover all problems, strategies, and medications for migraine during pregnancy in this article. It is important to have a health care provider who understands you and your migraine disease and can openly discuss your options. If you do not have this type of provider, empower yourself to go find one. It is possibly more important during pregnancy than at other times in your life to maintain all your non-medication anti-migraine strategies. Prepare yourself for excellent self-care and know that the nutritional, behavioral, and mental tricks you’ve always used to keep yourself healthy may need to be updated for a few months. This article will focus on pharmacological migraine treatments for expectant mothers who may need it. Adequate and well-controlled studies have failed to demonstrate risk to the fetus in the first trimester of pregnancy (and there is no evidence of risk in later trimesters). Animal reproduction studies have failed to demonstrate risk to the fetus and there are no adequate and well-controlled studies in pregnant women. There is positive evidence of human fetal risk based on adverse reaction data from investigational or marketing experience or studies in humans, but potential benefits may warrant use of the drug in pregnant women despite potential risks. Studies in animals or humans have demonstrated fetal abnormalities and/or there is positive evidence of human fetal risk based on adverse reaction data from investigational or marketing experience, and the risks involved in use of the drug in pregnant women clearly outweigh potential benefits. Beginning with the simplest and safest medication options, acetaminophen (or Tylenol, pregnancy category B) is considered the first line of therapy to control pain in a pregnant female. If you are lucky enough to have Tylenol on your list of effective migraine strategies, leave it on the list. NSAIDs (such as ibuprofen, pregnancy category B during the first two trimesters, category D in the third) have some risks that are dependent on trimester. Mainly, maternal ingestion of NSAIDs during the third trimester of pregnancy has been linked to premature closing of the ductus arteriosus. This is a vessel that allows most of the blood from the fetal heart to bypass the lungs because they are non-functioning and filled with fluid until birth. Data shows that the second trimester is the safest time for women to use NSAIDs, and it is not uncommon for physicians to prescribe treatment plans that include NSAIDs in this timeframe. A number of studies have evaluated a possible effect of NSAID use in the first trimester on miscarriage and congenital malformations. At this time the findings on this topic are not conclusive. If NSAIDs are an important part of your migraine treatment plan, discuss with your healthcare provider the option of using them during only certain timeframes during your pregnancy. Studies on triptan (pregnancy category C) use during pregnancy has been fairly reassuring. For pregnancies where triptan use is needed, sumatriptan (Imitrex) is usually the first triptan to be prescribed. Sumatriptan has been available longest and has the most safety data. Other triptans have not been shown to be harmful, but they have rarely been studied. It has been hypothesized that the vasoconstricting action of triptans could cause harm to an unborn fetus. However, studies have investigated outcomes including miscarriage, congenital malformations (physical defects present at birth), prematurity, and low birth weight and found no conclusive evidence of adverse effects. Sumatriptan is also helpful because it can be used by women with cluster headache during pregnancy. Some people use dihydroergotamine (DHE) as a rescue treatment for their migraines. Unfortunately, ergot alkaloids like DHE are contraindicated in pregnancy (category X) due to their ability to cause vasoconstriction of the uterus. Studies have linked the use of these medications during pregnancy with low birth weight and preterm birth. Opioids are not considered an effective treatment for migraine and are rarely prescribed as a rescue treatment in this setting. A large study found a link between the use of opioids in early pregnancy and certain fetal problems; however, the study had some methodological limitations. If necessary, short-term use of opioids in pregnancy is a possibility. However, this is not are not a common strategy used in migraine. Beta-blockers have long been considered a good migraine prevention option in pregnancy. There is evidence showing an association between the use of beta-blockers during pregnancy and complications including babies born small for gestational age, preterm birth, and perinatal mortality (fetal death around the time of birth). However, many believe it is underlying hypertension in the mothers that may lead to these associations, not their use of beta-blockers. Women in these studies were more commonly prescribed beta-blockers for hypertension than for migraine. One beta-blocker in particular (oxprenolol) has been associated with orofacial defects (like cleft lip and cleft palate), cardiovascular (of the heart and blood vessels), and neural tube defects (structural problems of the brain and spinal cord). However, oxprenolol is rarely prescribed. If preventive treatment is needed during pregnancy, beta-blocker is commonly chosen as the first line of therapy. The metabolism of some medications is increased in pregnancy and metoprolol (pregnancy category C) is one of these. It may take a higher dose to achieve efficacy in pregnancy than at other times in a woman’s life. Newborns born to moms on beta-blocker therapy should be monitored for possible complications including slow heart rate, low blood pressure, and hypoglycemia. Unfortunately, other anti-hypertensive medications sometimes used for migraine like ACE inhibitors and calcium channel blockers are either contraindicated or not commonly prescribed in pregnancy due to documented adverse effects to the fetus. If these are an important part of your migraine prophylaxis it is best to discuss another option with your prescriber. Amitriptyline (pregnancy category C) is often considered the next choice after beta-blocker for treating migraine in pregnancy and has the most supporting data for treatment of migraine in pregnancy of any of the anti-depressants. Like metoprolol, amitriptyline is a medication that could require a higher dose in pregnancy in order to be effective. There is a very small amount of data on use of this medication during the third trimester that suggests possible associations between amitriptyline and preterm birth, breathing trouble after birth, and hypoglycemia (low blood sugar). But there have not been enough studies to form conclusive evidence. Valproate (pregnancy category X) is considered effective in the setting of migraine; however, it is contraindicated in pregnancy. It has been very clearly linked with birth defects like neural tube defects and cleft palate. Its use in late pregnancy has also been associated with autism, impaired cognitive function, and reduced intelligence. For these reasons this medication is often not prescribed for migraine to women of childbearing age even in the absence of pregnancy. Topiramate (pregnancy category D) use in early pregnancy has been associated with oral cleft abnormalities in newborns. If topiramate is a crucial part of your treatment plan, it is important to have a conversation with your physician about modifications or replacements in your prescribing plan. There is not much data available to guide us on the use of Botox (pregnancy category C) in pregnancy. But it has not been associated with any adverse events in the fetus. Well-controlled trials have not been conducted for this medication in pregnancy; however, there is a case report of a woman who started Botox for migraine in her 18th week of pregnancy. Her child was followed for 6.5 years with no adverse events. Botox has been placed in category C predominantly due to the fact that there is so very little data available on its use in pregnancy. The first anti-CGRP medication (erenumab or Aimovig) has only been available for a year. The pregnancy category for this class of medications is currently listed as “Not Assigned”. At this time, these medications are generally not being prescribed to expectant moms or women who plan to become pregnant. CGRP is a neurotransmitter that research has shown plays a role in blood flow to the uterus and placenta, and is important in fetal development8,9. Some women take magnesium or riboflavin supplements as part of their anti-migraine regimen and both have some data showing they can be effective. Magnesium has been used extensively in pregnancy, particularly in antacids and in the treatment of preeclampsia (a serious condition of hypertension during pregnancy). There is a follow-up of their children extending as long as 11 years. It is considered safe. Riboflavin, on the other hand, has no data on fetal risk and is not recommended in pregnancy. If possible, it is always best to work out a treatment plan with your healthcare provider for migraines during pregnancy that will help you avoid developing status migrainosis (a migraine lasting over 72 hours). Status migrainosis is stressful on the system and can lead to dehydration. If you do find yourself with this type of severe migraine during pregnancy, a recent paper indicates that the best options for you may be either nerve blocks with lidocaine or intravenous metoclopramide. Metoclopramide (pregnancy category B) is a medicine that was originally used to treat nausea and vomiting in pregnant patients. However, it was discovered that it also improved pain from migraine. Feeling anxious about how to treat your migraines while pregnant is normal. It is best to foster a good relationship with your provider and form a pregnancy and migraine plan early on. This can decrease the stress on you and your baby by keeping you healthy. Amundsen S, Nordeng H, Nezvalova-Henriksen K, Stovner LJ, Spigset O. Pharmacological treatment of migraine during pregnancy and breastfeeding. NatRev Neurol. 2015 Apr;11(4):209-19. Hamilton KT and Robbins MS. Migraine treatment in pregnant women presenting to acute care: a retrospective observational study. Headache.2019 Feb;59(2):173-179. Amundsen S, Ovrebo TG, Amble NMS, Nordeng H. Risk perception, beliefs about medicines and medical adherence among pregnant and breastfeeding women with migraine: findings from a cross-sectional study in Norway. BMJ Open. 2019 Feb 27;9(2). Wells RE, Turner DP, Lee M, Bishop L, Strauss L. Managing migraine during pregnancy and lactation. Curr Neurol Neurosci Rep. 2016 Apr;16(4):40. Meidahl Petersen K, Jimenez-Solem E, Andersen JT, Petersen M, Brodbaek K, Kober L, Torp-Pedersen C, Poulsen HE. Beta-Blocker treatment during pregnancy and adverse pregnancy outcomes: a nationwide population-based cohort study. BMJ Open. 2012 Jul 19;2(4). Robinson AY, Grogan PM. OnabotulinumtoxinA successfully used as migraine prophylaxis during pregnancy: a case report. Mil Med. 2014 Jun;179(6). Yallampalli C, Chauhan M, Endsley J, Sathishkumar K. Calcitonin gene related family peptides: Importance in normal placental and fetal development. Adv Exp Med Biol. 2014;814:229-40. Yallampalli C, Chauhan M, Sathishkumar K. Calcitonin gene-related peptides in vascular adaptations, uteroplacental circulation, and fetal growth. Curr Vasc Pharmacol 2013 Sep:11(5):641-54. Dr. Lindsay Weitzel experienced chronic daily migraine from the time she was four years old until she was thirty. Her constant migraine attacks caused enough damage to give her complex regional pain syndrome (a ceaseless pain like burning fire) down the right side of her face, head, neck, and arm. Lindsay believes that having no memory without daily pain gave her a unique perspective on living with and fighting off her disease. Lindsay has a Ph.D. in Analytical Health Sciences and a Master’s degree in Nutrition. She works full-time as a Migraine Strategist and has opened a clinic dedicated to improving the lives of people suffering from chronic migraine. She also works as a Migraine Medical Writer and published a graphic novel for kids and adventurous adults with migraine called Super Zoe the Migraine Hero, available on Amazon. Lindsay is the founder of a FaceBook group for migraine patients called MigraineNation, Headquarters For Those With Chronic Migraine. You can also see more about Lindsay on Facebook or contact her through her webpage. Find more of Lindsay’s blog posts here. Support research, education, and awareness of migraine disorders.